This garland holds 13 6” x 4” photos from your baby boys first year. Photo Garland. 1 x Photo Garland holding 13 Pictures. Big Night is all about making your party a big one whether its in or out, make it a Big Night! The piece will cover 12 foot (3.66m) when used as a whole piece. Can easily be cut into smaller pieces if desired. John Lewis Talking Tables Party Animal Garland. 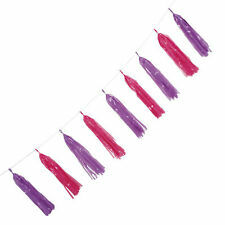 Wish someone a very happy birthday with this fun and colourful garland, 3.5m long by Talking Tables. Used and hung once for a baby’s first birthday and bought along with lots of other bits in the range in John Lewis- invites, party bags, balloons, plates etc. No rips or tears, in great condition, folded up neatly. No longer have cellophane packet however. Creates a great theme for a birthday and great when bought with other bits in the range. Will be selling more in the range that wasn’t used on the day. The iridescent foil finish will look like the unicorns are wearing fairy dust! 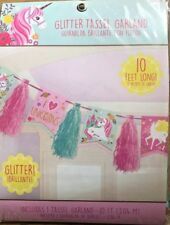 Our unicorn garland is made of unicorn mystical dreams! Easy to hang on walls, doorways and around venues it will bring happiness to all your guests! 10ft (3m) LENGTH APPROX. IDEAL FOR ANY CELEBRATION. Each baby blue clothespin is adorned with a glittery, scallop-edged cutout. With a matching blue photo mat to go behind each photo, this photo garland looks professionally made! Party Supplies. Fancy Dress. All of our garlands are made with 1/2 sheet of quality tissue paper. They are then attached to twine using patterned washi tape and are sent to you fully assembled and ready to hang. We're happy to work with you to get things exactly as you want them and we really are very friendly! We’re happy to customise any of our garlands for you as these garlands can be made in any colour you like! We’re happy to customise any of our garlands for you as these garlands can be made in any colour you like! Estimated dispatch. They are then attached to twine using patterned washi tape and are sent to you fully assembled and ready to hang. We’re happy to customise any of our garlands for you as these garlands can be made in any colour you like! The paper lantern garland features 6 brightly coloured individual paper lanterns hanging from a 12ft long cerise satin ribbon. Each paper lantern has a cut-out card shape hanging from the bottom of the lantern. We’re happy to customise any of our garlands for you as these garlands can be made in any colour you like! Custom Orders. Disney Frozen ice skating paper chain link garland party decoration This great party Disney Frozen chain link garland is a cool birthday decoration to make the room look amazing and fun. Size one size Great for your party's, take a look at all of our other party supplies. Type Garland. Main Colour Pink.